He isn’t new to the music scene, but Pat Ferguson has a new feeling about it. “There are exciting things happening right now for the groups coming out of Madison. Really exciting times around here,” Ferguson says. And his own timing may be contributing to the excitement, as he is on the road promoting his first solo album, “Light of Day / Dark of Night,” after touring with a band for years. Pat also has a regular Wednesday night residency at HotelRED in Madison, which he says has helped fuel much of the material on the new album. 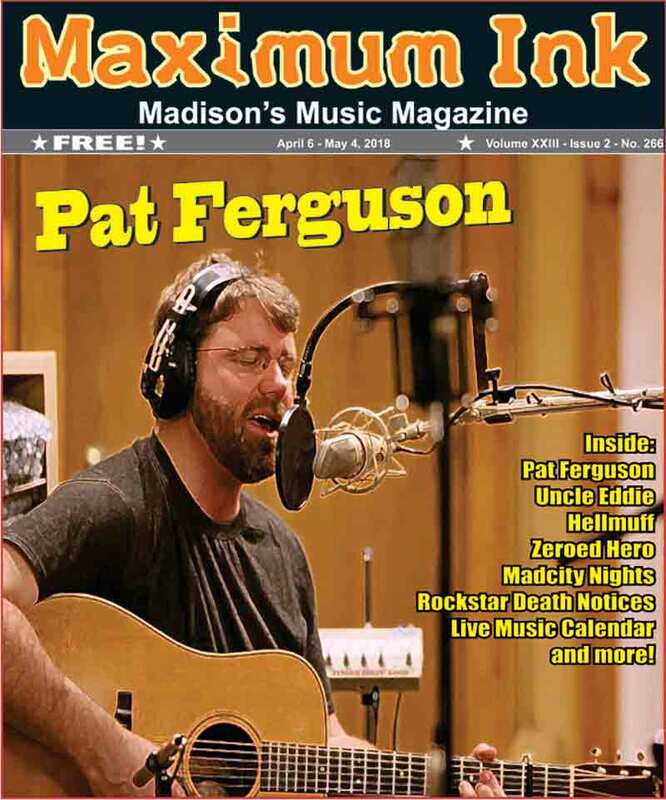 Pat will be releasing the album for the first time at a show on April 27, 2018 at the Stoughton Opera House in Stoughton, and took time to answer our questions about this new stage of his career, and how he’s always been connected to music. Maximum Ink: Why do you have such a strong connection to music? Pat Ferguson: The feeling of connecting with people through music is very special to me; whether it be through conversation, playing on a stage, standing in front of a stage watching, or just being on my own and allowing myself to sink into a certain song or record. I knew in some way, shape, or form, music would play a major part in my life. Now to have people come up to me and tell me how much a song of mine means to them, or that at a particular show they felt such a strong connection to not just the music itself, but the overall energy and feeling of the night, that is something that never gets old and is so amazing. My dad is a huge old school country fan, along with bands like The Beatles and Eagles, so I was introduced to a lot of that music at a very young age. We always had singalongs at family gatherings, watched concerts on TV together, talked about the music and/or lyrics and what they meant to us. We still have them regularly and now incorporating the tunes that I have written into the mix is a trip. MI: We talked a little about your family, where did you grow up, and what brought you to Madison? PF: Originally from Houston, Texas, and we moved to Manitowoc, Wisconsin when I was a kid. My dad is from the Manitowoc area, and my mom’s side of the family settled in the greater Chicago-area. I went to school at UW-La Crosse, where I met Christian Staehly and we formed the Smokin’ Bandits. It is also where I met my wife, Evie, and she is from the Madison area. We’ve been here more than ten years now, and it is such an awesome community. The musicians are tight-knit and supportive, and love playing together. MI: Well, you are one of those talents who is able to play anything! But is there a style you really love? PF: Thank you for saying that, I’ve been really privileged to play with a wide range of bands over my career. Honestly, after so many years of touring with such a high-energy and loud band like the Bandits, I have started to find solace in the simplicity of acoustic music (both in terms of playing and listening). The Wednesday residency gig at HotelRED in Madison has fueled it, and the acoustic-based, finger and flat-picking style guitar work on the upcoming record is representative of where my head is at in terms of style and preference right now. MI: Would you tell us more about your new and first solo album? PF: “Light of Day / Dark of Night” is being released in late April on LoHi Records. The record itself paints a picture of retrospect and what it means to ride the highest of highs, or lowest of lows, while longing with admiration and curiosity for the other. It was produced by Adam Greuel of Horseshoes & Hand Grenades, someone I first met when he sat in with the Smokin’ Bandits at the age of 13. We kept in touch over the years, and to have this be his first gig in the producer’s chair, and my first crack at a solo record—there’s something really special about that for both of us. The core group of musicians tracking the record included myself, Samual Odin (Horseshoes & Hand Grenades) on upright and bowed bass, and Kenny Leiser (WheelHouse) on fiddle. We went for a theme of “simplicity” with the tracking, having just Acoustic Guitar, Fiddle, and Upright Bass as the base tracking elements. The sounds we were able to achieve within the space between each of of those instruments, and then maintain as we layered in additional tracking, is something special. We’re ready for folks to be able to take it all in. MI: And you are already touring heavily to promote it? PF: I just got off the road after doing solo shows across Minnesota, Wisconsin, and North Carolina in support of the first single release, “The Night (The Temptress).” My goal is to get this record and the songs to people’s ears; to have them listen and feel whatever it means to them. We’re working hard to make that happen in the Midwest and beyond. MI: How are you feeling about this whole process, just weeks from the full release? PF: I am entering into uncharted territory here. I am incredibly proud, and even more so, humbled by the work that has gone into this record. That said, something tells me we’re just getting started, and that is as daunting as it is exciting for me. So, I’m very much looking forward to seeing how this whole thing shakes out. MI: I want to hear about your musical background. What did you start playing, and when? PF: Music has always been a big part of my life… My dad is a huge old school country fan, along with bands like The Beatles and Eagles, so I was introduced to a lot of that music at a very young age. We always had singalongs at family gatherings, watched concerts on TV together, talked about the music and/or lyrics and what they meant to us. We still have them regularly and now incorporating the tunes that I have written into the mix is a trip. Piano lessons at 6, then cello and clarinet in elementary school bands. I started playing guitar at the age of 12, one of my good friends received guitar lessons as a Christmas gift and wanted someone to take them with him, after the first lesson I was hooked and never wanted to put it down. Guitar is my dominant instrument, but I also can hang on the mandolin and try to play piano albeit not very well. Number one goal that I have instrumentally is to be able to sit down at a pedal steel and play it the way I can pick up a guitar and play it. It is much more than a one way connection from the people playing the instruments, to the music that comes out of them, to the crowd that takes it in. Whether its a big theatre or small venue, there is a circular exchange between the stage and the audience members that can be so powerful, and in my mind has to be there in order for the experience to be complete. There’s a Greensky Bluegrass tune that starts with the line “it’s not enough to feel it, it needs to overwhelm you.” That’s how I view music, and the connection with others through music, to a tee. MI: You connected with a lot of people for your new album. You mentioned a few, but who else contributed? PF: Other contributors include Jacob Jolliff (Yonder Mountain String Band), Kyle Keegan (Ben Howard & Mandolin Orange), Chad Staehly (Hard Working Americans & Great American Taxi), Sarah Vos (Dead Horses), and Horseshoes & Hand Grenades. LoHi Records is an independent label out of Greensboro, NC formed by Jim Brooks, Todd Snider, Tim Carbone (Railroad Earth), and Chad Staehly, and we are very fortunate to be working with them on this release. The record itself paints a picture of retrospect and what it means to ride the highest of highs, or lowest of lows, while longing with admiration and curiosity for the other. To me, I’ve always wrestled with the division between the two, and it took until the end of this recording process to realize that the collection of work and story behind it is not about the division between joy and pain; it is about one collective experience that has made me who I am today. I believe that the theme, and whatever folks want to assign to what metaphorically is represented by “Light of Day” or “Dark of Night,” is something that the listener is really going to be able to relate to. The output of the studio effort, sonically, is just so unique. MI: And you are already touring to promote it. What’s on your schedule? PF: I just got off the road after doing seven solo shows across Minnesota, Wisconsin, and North Carolina in support of the first single release, “The Night (The Temptress)” featuring Jacob Jolliff of YMSB. On Friday 3/30 we released the second single, “Fuel the Tide,“and plan to release one more on 4/13 that will feature Chad Staehly (Hard Working Americans / Great American Taxi) on keys. We’re also focused in on the first three release nights, 4/26 at Icehouse in Minneapolis, 4/27 at Stoughton Opera House just outside of Madison, and 5/4 at Anodyne in Milwaukee. Each night will feature some contributors from the record along with a host of other special guests. From there we move into festival season and will be hitting spots including Revival Music Festvial (Harmony Park - Geneva, MN), Jam for Jam Music Fest (Marshall, WI), Bon Fire Music & Arts Festival (Yuba, WI), St. Paul Beer Fest (St. Paul, MN) along with a host of others to be announced. My goal, simply, is to just get this record and the songs to people’s ears…To have them listen and feel whatever this record is going to mean to them. We’re working hard to make that happen in the Midwest and beyond. MI: What makes you the most proud right now? PF: First and foremost, we have two beautiful daughters and a wonderful life that my wife and I have worked hard to build for ourselves. My family has been so supportive of this effort after quite a few years of me being off the road, at least as much as I have been recently and plan to be in support of the record. I can’t even begin to explain what their support means to me. Musically, I have been fortunate to share the stage with some of my idols in music (Merle Haggard, Little Feat, Dr. John, Jason Isbell, Todd Snider, among others) which were opportunities that I cherish will never in my life take for granted. That all said, this record and the effort behind it is something that I am so very proud of. It is my first solo effort, and the way things have come together has been very humbling. A lot of blood, sweat, and tears went into this one, we’re just so excited for folks to get their heads, hearts, and ears wrapped around it. “Light of Day / Dark of Night” is out 4/27/18 on LoHi Records.